Note: You can add 3tsp chilly powder & 1tsp coriander powder instead of non-veg masala powder. Soak green peas overnight or 1 1/2hr in warm water. Pressure cook keema with 1tsp salt & water (water should cover 1 inch above the keema) whistles for 2-3 times. Don’t drain water store it to use later. Note: Pressure cooking the keema will separate excess fat from the meat. You can use this fat rich water as much as required for gravy & rest can be drained. By this you can avoid extra fat. Pressure cooking the keema can be skipped if you don’t like to remove the fat. Coarse grind all the ingredients. Add onion & 1tsp salt, sauté till light brown. Add green peas sauté for 2-3min or till it becomes soft & looks skinny. Add keema (separated from water), close the lid. Stir in between till water evaporates. Keema turns light brown colour. Add grind ingredient, sauté for 15min. Add stored water for your requirement to make gravy. Add salt, cook till it leaves oil on top. Keema gravy is great combination for Chapatti & puri (Indian breads). Tempting and mouthwatering kheema gravy, looks fantastic...makes me hungry..
Wooow,,kheema with peas gravy is my faaaav with roti. ur's looks delicious with nice photography. wow my first time here ....delicious looking keema ...makes me hungry. 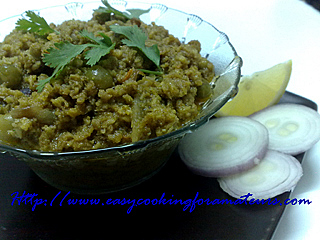 Wow, keema gravy looks delicious...just perfect with soft rotis, this picture is really tempting me a lot. Very interesting recipes. I love to try new foods and new cuisines.